There comes a time in all of our lives when we need to plan or take part in a funeral for a dearly departed friend or relative. One of the most important decisions you will need to make involves choosing the ideal arrangements of flowers for their funeral. When making this decision you will need to know the various types of arrangements available, and which types of flowers best suit the funeral you have planned or will participate in. There are a wide variety of arrangements available to you, including ones that can be sent to the family or church of the departed. Florists are happy to transport the flowers you pick for the funeral service to the burial site, and are also able to prepare the flowers in attractive baskets for you or the family to take home after the funeral. Coffin sprays, which are four-foot decorative drapes laid over the coffin during the funeral service, as well as heart-shaped arrangements, are both very popular and likely to serve your need admirably. The heart arrangements tend to last for longer periods and display flowers beautifully while also conveying your love for the departed. It is also possible for you to order decorated pillows and cushions with flowers and other designs for the interior of the casket. There is no limit to the variety of flowers that can be used for a funeral arrangement, and many people choose them based on the personality or gender of the departed. Very popular are white chrysanthemums, which can be sprayed with color to create the arrangement that you need and find appropriate. If you need something a little more specialized, tropical and green plants can be combined. For a fundamentally appropriate choice, any variety of white flowers is always a good idea, as white symbolizes truth, integrity, calmness, and serenity among other noble virtues. Roses of any color are a very popular choice of flowers for funerals, and carry with them a traditional appeal. Chrysanthemums are more popular than carnations due to the expense of the latter, but either can be used depending on your need for the funeral. As you can see, pretty much whatever you need to prepare the perfect arrangement is readily available to you. 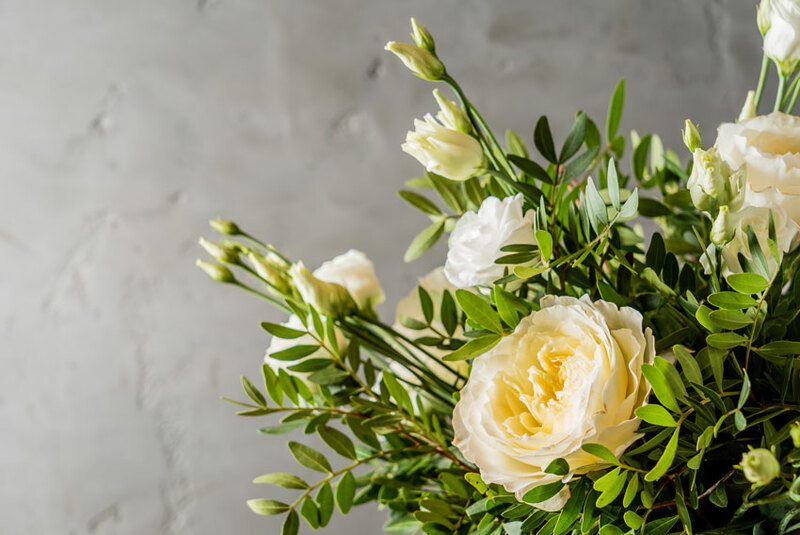 Whatever your choice, one thing you need to remember is that a funeral floral arrangement should come from your heart to represent the bond that you shared with the departed. Aside from giving a personal eulogy, there is no more fitting a gesture than to provide a beautiful arrangement of flowers for the casket, service, or family. If words are fleeting and you need a way to express your feelings, floral arrangements are touching and effective ideas. When the time comes, saying your farewell with flowers is a beautiful and heartfelt way to convey your sympathy and love. All works are © copyrighted by Brant Florist. Feel free to reference these articles directly from our Website by hyper linking into any of these article pages. Copying or reproduction of these articles (in their entirety) is allowed provided that credit is given to www.brantflorist.com with a hyperlink to http://www.brantflorist.com and you send an email to gifts@brantflorist.com advising us where the copied article has been placed. Copying portions of the article is strictly prohibited unless written permission has been obtained from Brant Florist.